I recently flew in a ‘no doors’ helicopter above San Francisco whilst being filmed for a documentary focusing on my career. Wow, what an amazing experience! I’ve been fortunate enough to previously fly over both New York and Miami . However, cruising over the Bay Area on a perfectly clear day was a totally different experience; completely breathtaking and made for some stunning photo opportunities. I can’t wait to add this city to my fine-art Urban Symmetry series which recently was shown in New York and Germany. In the meantime, given that I’ve now photographed quite a few times out of helicopters, I thought I’d put together some of my top tricks and tips for anyone who is planning on taking their camera and shooting in the skies out of a chopper. Enjoy! Always look fo unique oblique angles when shooting out of helicopters. Here’s the Salesforce Tower looking South all the way to Twin peaks. Photographing from a helicopter takes preparation, planning and research therefore organization beforehand is crucial. Space inside a helicopter is incredibly limited so you want to take as little as gear as possible to mean you can concentrate on shooting and enjoying the flight. I would also advise taking the minimum amount of accessories when as it is unlikely you will have an opportunity to change memory cards or fish around your bag for filters or other accessories; the last thing you want is a lens hood falling off and hitting someone on the head…that’s a serious law suit on your hands!! I would actually advise removing all hoods off your lenses before flying and leaving them on the ground. I also would take the largest capacity memory cards you have to mean you don’t have to change them when in the air; I loaded my two bodies with two 64gb high speed Lexar Compact Flash Cards. Additionally, changing lenses during flight without introducing dust into your sensor with the wind swirling around is virtually impossible. Meanwhile, the strength of the wind generated by the rotors, means even if you tried to change lens there is a good chance of it falling out and you never seeing it again. Also, have a think if possible of what you want to capture before taking flight. I had carefully thought out a shot list before setting out considering what I wanted to capture as well as the position of the sun, angle of the light and where I would need the helicopter to be positioned to get the perfect shots. Fortunately, I was working with a fantastic pilot, John from Bay Aerial Photo, who really understood my vision and was able to get me into the ideal spots. Communication with the pilot is also really important. They will have flown these routes hundreds of times before and will be able to get you in the right positions to get your shot. To ensure that you don’t need to switch lenses at any point, I recommend bringing two cameras if you can. 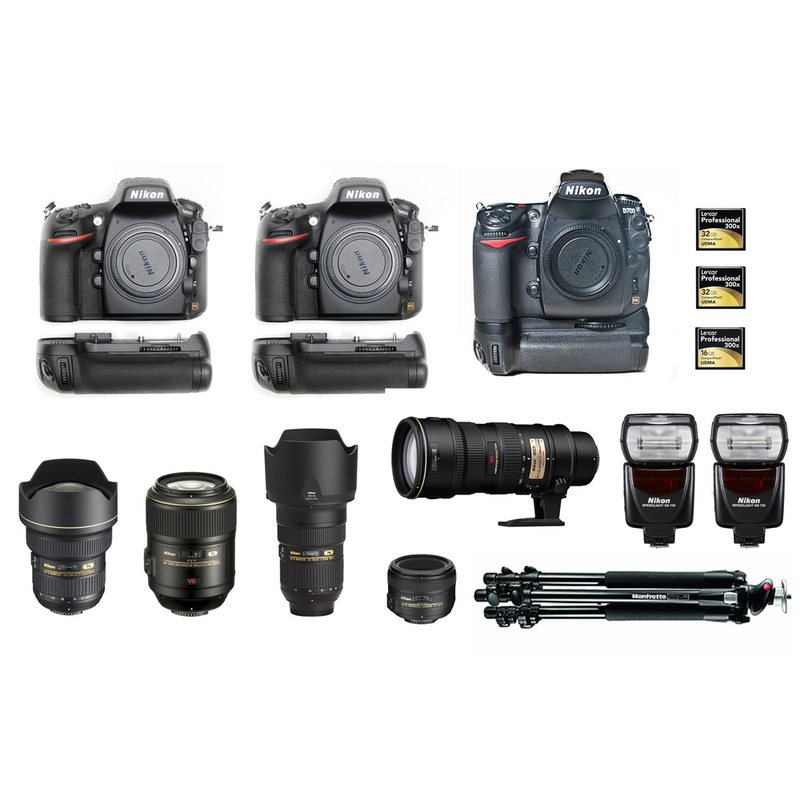 I flew with the Nikon D850 and D800 securely attached to my torso with my trusty Black Rapid straps and a GOPRO 4 strapped to my chest for behind the scenes video and my Manfrotto Sling Bag tucked into a small compartment and tethered to the front passenger seat should I need any miscellaneous gear in an emergency. I was fully harnessed to the helicopter both on the frame and the floor before take off, meaning that I could virtually step out of the doors as I increasingly gained confidence and shoot directly down onto the city before and avoid getting the skid in the shot. Shooting the Golden Gate with a 24-70 lens! Notice that I’m wearing a beanie and thick jacket… It’s often much chillier when up in a helicopter. You want to make sure that all your gear is secure and fastened down before take off as helicopters can move around a lot; you do not want things rolling around the chopper or even worse falling out. Everything needs to be clipped to the helicopter or me at all times with no exceptions. Even a pair of sunglasses falling off could become a dangerous projectile if falling off over San Francisco. Therefore, tethering all of my bodies using a variety of different clamps and cords was vitally important to ensure that everything was secure and safe. As I was flying with just two bodies and knew that I would not be able to regularly and easily switch lenses, lens choice was crucial to maximize my time in the sky. I knew I wanted to try and capture the city with wider, abstract angles as opposed to tight crops so opted to take up my Nikon 24-70mm 2.8 on my D800 and my Nikon 14-24mm on my D4. In truth, I ended up shooting 95% of the shots with the D800 as it soon became obvious that the 14-24mm was a little too wide. I was constantly capturing both the rotors of the chopper and the skid, that part of the helicopter on which it rests on the ground or where you can rest your feet. With the 14-24mm it also soon became apparent that blurry rotor blades were creeping into my frame thus ruining an otherwise perfect sunset or moody sky. Knowing this will save you a lot of time and frustration in post-production once you’re back on the ground. Occasionally, it was quite nice to use the wider lens and capture the helicopter in the shot in order to contextualize the shot and it was also useful for behind the scenes. However, I was definitely more comfortable with the versatility and focal length that the 24-70mm offered me and ended up using this lens for the majority of the time. I would love to fly another time with a 70-200mm to capture some more tight photographs where I could pick up some more on details of buildings and elements of landscapes but I was very content with the images captured with the 24mm-70mm and would recommend this as a good focal length for your aerial photography adventure. A beautiful, clear day in San Francisco made for the perfect conditions for an aerial photograph of the Golden Gate Bridge with Marin, Tiburon, Salsultio in the background. The versatility of using a 24-70mm lens gave me the otpion to either come in tight or get the whole bridge in the frame as with this shot. Looking straight down on the South Tower of the Golden Gate Bridge in San Francisco as a boat passes through the Bay. In terms of camera settings, given my familiarity with my cameras I always shoot on manual but, always considered shutter speed as my main priority. There is a huge amount of motion and vibration inside the heli with constant vibrations and shaking all potentially causing your photographs to be soft. Subsequently, a general good rule to follow during the day is that you double your focal length in terms of shutter speed. By this I mean, that if you are using a focal length of 500m you should be shooting at 1/1000sec or faster. In practice though if you don’t have a large lens, I would ideally (obviously dependent on light conditions) still try to shoot with a shutter speed of 1/1250 or higher if possible. I did have to drop mine down much lower when shooting at night and push up my ISO but ideally you want to keep that shutter speed fast to keep your photographs free of motion blur. Luckily, with the advancement in CMOS sensors, you are now able to shoot on the high-end cameras at 3200 or 6400 with relatively clean images making shooting at dusk or night much easier than a few years ago where it would have been near on impossible. I find with my D800 that I can get relatively clean shots close to 3000 so pushing my ISO was not too much of a concern for me. I would rather have slightly noisy photographs than soft ones where I can do nothing with them in postproduction. Also, avoid leaning on the side of the chopper for stabilization; remember it is constantly moving and vibrating. Therefore, it is not providing a sturdy support and will merely server to create more blur in your images. Another helpful tip is to lean forward so that your back is not in contact with your seat back if you are not sitting on the floor of the chopper as a lot of vibration transfers through the seat back to your body and therefore camera. Remember, the longer focal length you use will obviously also require a faster shutter speed especially if you start poking it out the chopper due to the swirling winds. 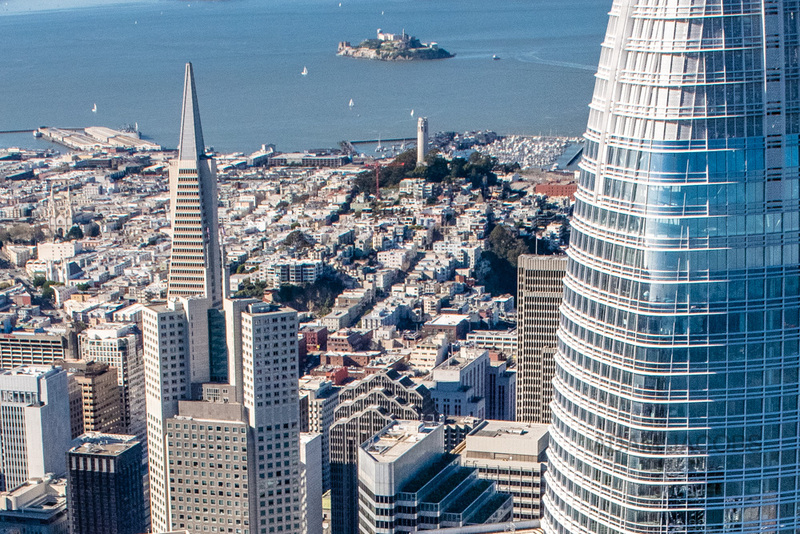 An aerial photograph of the San Francisco financial district including the SalesForce Tower, Transamerica Building and Bay Bridge taken in March 2019. A fast shutter speed and leaning slightly out of the helicopter ensured that this image remained totally sharp. Since I was shooting RAW files the whole time I kept my white balance on Auto and use the highly reliable AF-S on the Nikons switching from single to multiple focus points depending on what I photographing. Further, in terms of aperture I generally varied between f/5.6 to f/11 depending on the light available and the subject I was shooting. In New York it was a daytime shoot and despite it being overcast I was able to use a higher aperture than in Miami where less ambient light meant I had to close up my aperture out of necessity. I also chose to use manual ISO, which gave me greater control. On my first flight experiment, I did experiment a little with the Auto ISO feature but found that a lot of my images were coming out under exposed so quickly switched to manually control the ISO. My flight was in the mid afternoon so I was constantly changing my position in relation to the lower lying sun. Therefore, personally I preferred being able to quickly adjust my ISO to achieve the optimal exposure. Being able to quickly change the camera settings manually allows you to cope with tricky lighting situations such as this aerial photo. The sun was facing directly towards me and I had to adjust ISO and aperture to compensate and get the look I wanted, to feature Coit Tower looking all the way out to the Golden Gate Bridge. Make the most of being in the air and shoot constantly. I would recommend putting your camera on burst mode or even better bracketing exposures if lighting conditions are variable to ensure that you get the correct exposure. It is not often that you will have the chance to be in such a unique and fortunate position so I would take every opportunity to capture as many frames as you can; you can always delete them when you get home if you have too many but you won’t be able to go back up and take more photos unless you just happen to have a helicopter on tap – some of us can only dream! It is not everyday that one gets to go up in a helicopter so make the most of it. Obviously you will be primarily there to take pictures but don’t forget to take the time to lower your camera occasionally and give yourself a few moments to admire how different things look from high up and overall have fun making some fantastic photographs. Asking my pilot to position the helicopter lower enabled me to get this unique shot of Alcatraz in the foreground with the entire San Francisco city skyline perfectly composed behind it. Don’t be afraid to experiment with focal lengths and go tighter to capture different types of images.